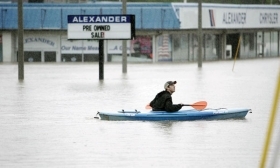 No shoppers at Barry Alexander's waterlogged dealership in Franklin, Tenn. Just an unidentified kayaker. For auto dealer Barry Alexander, the floodwaters in middle Tennessee were particularly bitter. Floods swamped his Dodge-Chrysler-Jeep in Franklin, about 15 miles south of Nashville. The store has stood near the normally sedate Harpeth River for nearly half a century. As torrential rains continued to fall last week, he quickly moved the inventory to higher ground -- but not high enough. The final count of lost vehicles? "It could be as high as 100," he says. Flooded creeks and rivers spilled into neighborhoods, homes, businesses, hotels and historic areas in the Nashville region. Motorists sat for hours on freeways, and in some spots the water rose to window levels. The family-owned Alexander group was in the process of moving the Dodge-Chrysler-Jeep dealership to a new location, to a Toyota store across town he is vacating and remodeling. But it was not time to move the vehicles. "My son Dane mentioned that we should move them on to the old Toyota store Saturday [May 1]," he says with regret. "Hindsight is 20-20." In addition to the Dodge and Toyota stores, Alexander also owns a Ford dealership, as well as Chevrolet, Buick, Hyundai, Nissan, Infiniti and Mazda stores. But the flooded Dodge store was special to him. His father opened it in 1963, and it was the family's first store. "I was a cleanup boy at that store," Alexander says, recalling memories of starting his career at the now-ruined store. "That's when cars were sold without AC and AM radio, and most were standard shift. How times have changed." Although times have changed, he has come full circle: He'll be cleaning up again.